So just a week before Halloween, do you know what you’re wearing yet? So after we have just written two posts about feather capes, now let’s just take at how they can be used in a Halloween costume. 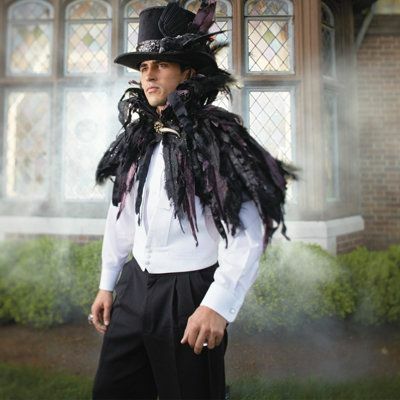 First up is this guy wearing a feather and a black crow hat. It said that it could be found on grandinroad.com but I was not able to find it. 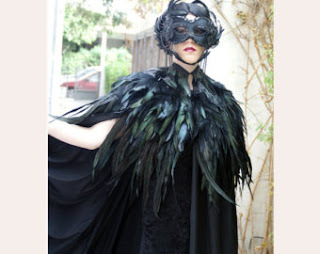 Here are another three great feather caped costume ideas found on the internet. You can make the capes out of feather Fringes as explained in our last post. I would suggest buying our 8-10 inch black iridescent CoqueFringe. Also take a look at our feather masks to find one that is right for you. Call today to find out if we can ship you’re so that you can get it in time for Halloween.